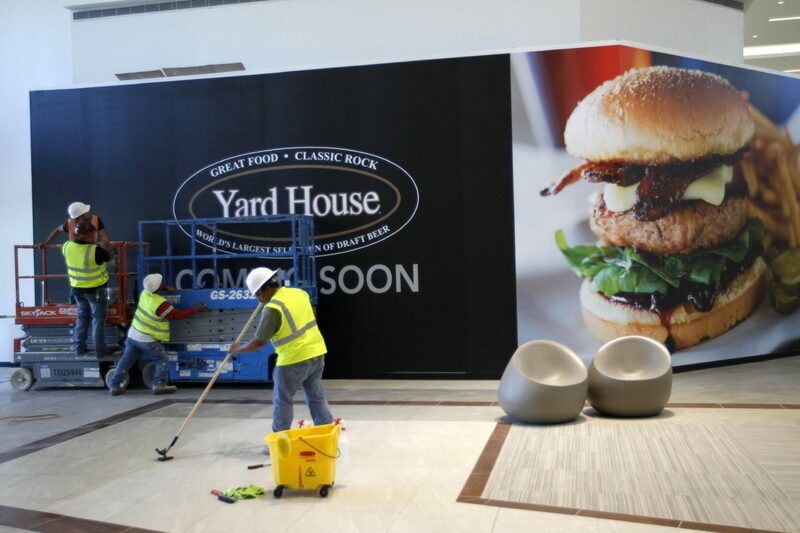 Construction crews work on the final touches of the La Plaza Mall expansion as a sign marking a Yard House restaurant is displayed on the wall Monday, October 30, 2017 in McAllen. 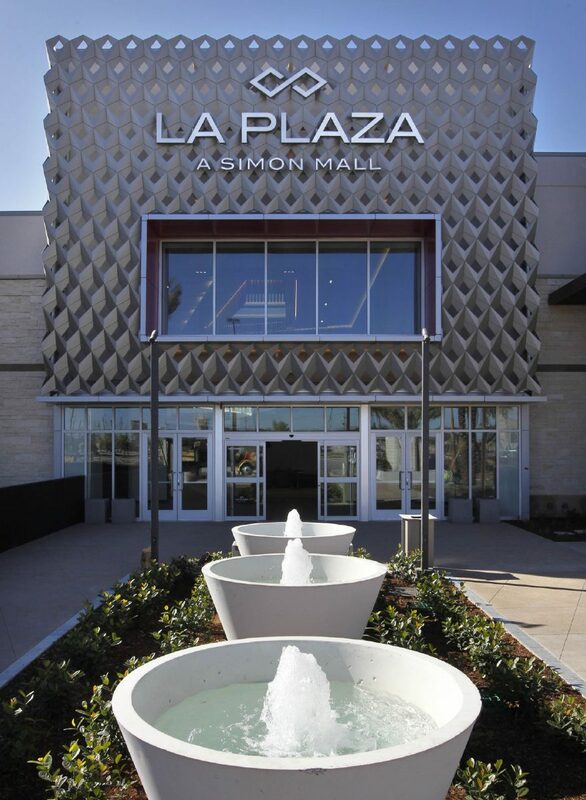 McALLEN — Fountains and palm trees line the new entrance to the $50 million expansion at La Plaza Mall. Outdoor seating for new restaurants overlook the foliage, turf and an open space the mall might use for small shows or concerts. The new wing of the mall will feature shopping destinations such as H&M, Zara and Kendra Scott and restaurants such as Yard House, Texas de Brazil and Rocky Mountain Chocolate Factory. 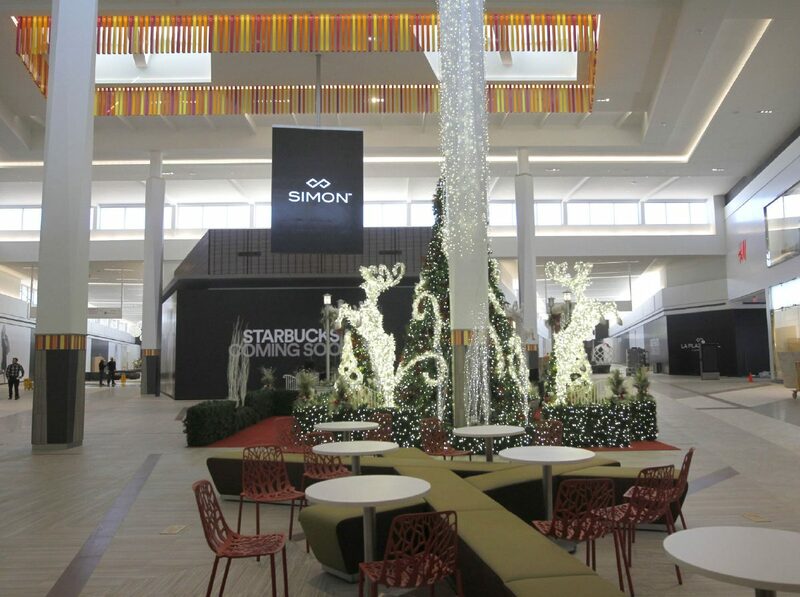 The Simon Malls property will have rolling openings, with the initial one Wednesday. Rocky Mountain Chocolate Factory, Reeds Jewelers and Sharol Shoes open Wednesday. Other stores will open periodically over the coming weeks and months. 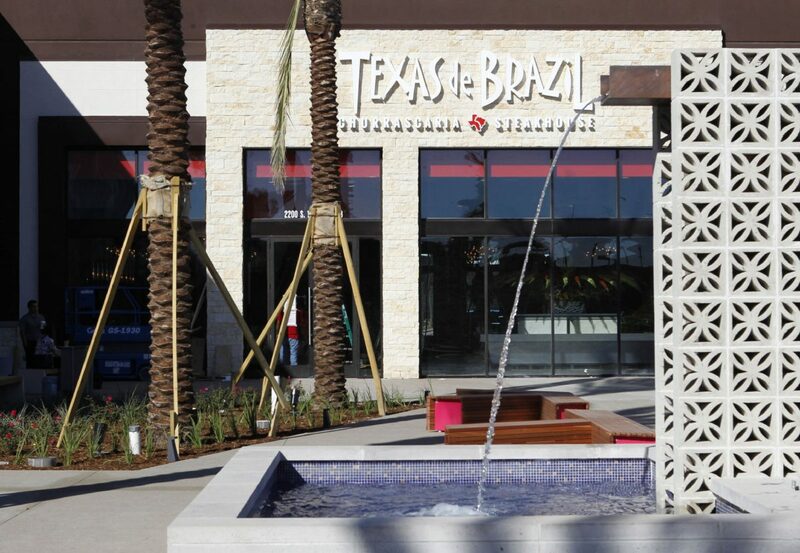 Kendra Scott is set for Nov. 10, Texas de Brazil on Nov. 14, H&M on Nov. 16 and Zara, Yard House and Palenque Grill expected to open in 2018, officials said. Other businesses will open in November, December and the coming year, but further details haven’t been announced yet. A large part of the expansion wing will be devoted to a holiday area for children and families. Once the holiday season concludes, construction will begin on more businesses. Once the expansion is totally complete, there will be more than 25 new retailers and five new restaurants at the mall. Water fountains lead toward the entrance to the $50 million expansion of La Plaza Mall on Monday, October 30, 2017, in McAllen. The expansion officially opens on November 1. 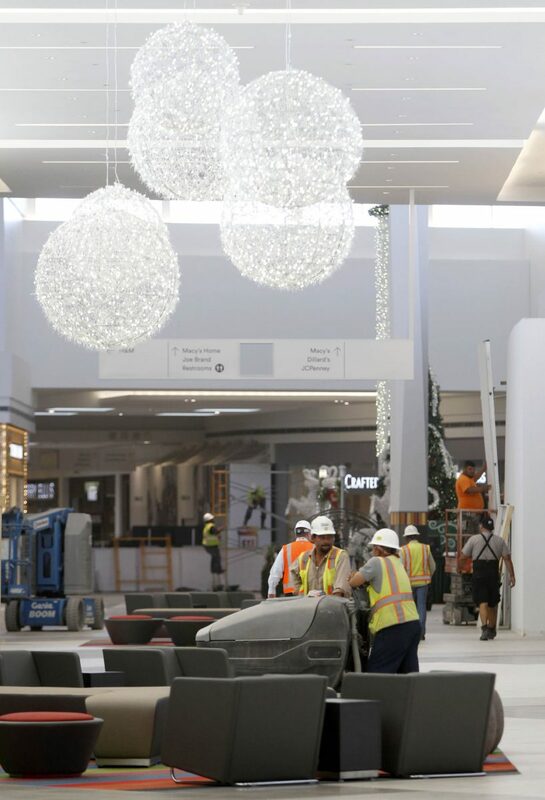 Christmas decorations begin to take shape in a large open area inside the expansion of La Plaza Mall on Monday, October 30, 2017, in McAllen. The mall's Santa Claus will take his seat this season inside the new expansion. 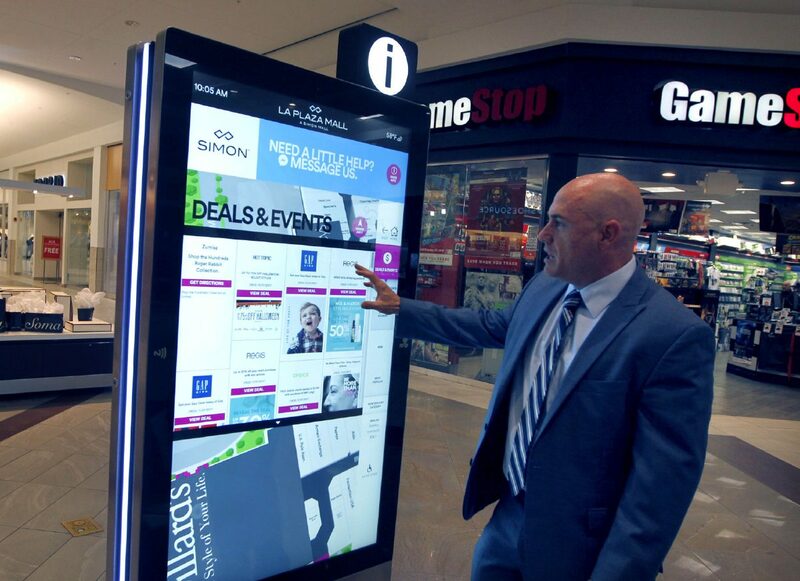 La Plaza Mall General Manager Robert Luciano demonstrates the new touch screen information kiosks inside the mall on Monday, October 30, 2017, in McAllen. Holiday decorations hang in the expansion of La Plaza Mall as work continues on the project on Monday, October 30, 2017, in McAllen. The outdoor entrance to Texas de Brazil in the expansion of La Plaza Mall is viewed on Monday, October 30, 2017, in McAllen. New seating and holiday decorations inside a wing of La Plaza Mall on Monday, October 30, 2017, in McAllen. 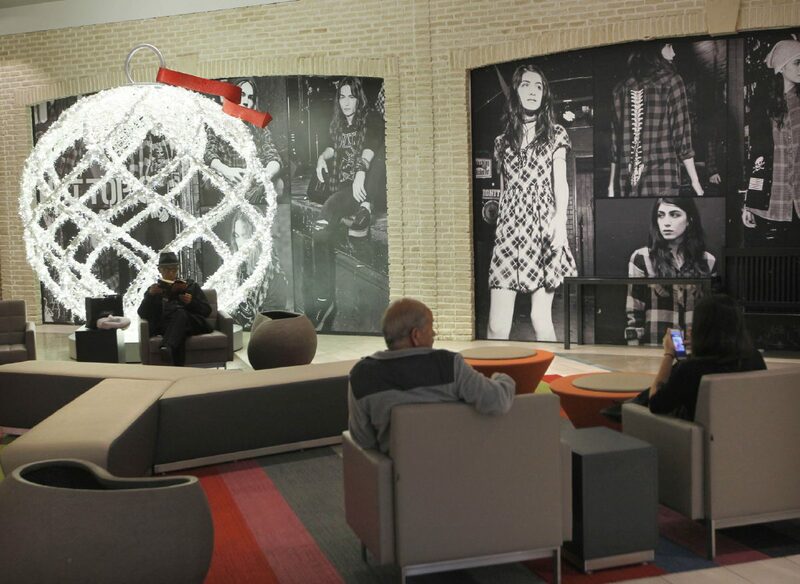 The mall updated flooring, lighting and furniture in existing areas of the mall in addition to the expansion project. Not only did the mall expand, but every mall entrance has been renovated, or will be soon. New lighting and flooring were also installed. Finally, and perhaps most critically, 2,000 new parking spaces have been added. A 740-space parking garage that connects to Macy’s opened nearly a year ago while a new parking deck with 1,260 spots connected to Dillard’s will open this week. Victoria Gonzalez relocated from Kendra Scott’s Austin headquarters to her native Rio Grande Valley to run the store at La Plaza. Hannah Thompson, director of marketing and public relations with Texas de Brazil, flew in from Dallas for the opening. As the restaurant was finishing construction earlier this week, Thompson explained that the churrascaria, or steakhouse, will be conveniently equipped for the mall. “I’m hungry already,” Luciano said.